When I was young I loved to play the Risk boardgame with friends. The game, like many games from the United States (Monopoly, The Game of Life) was based on luck in the form of dice rolls and a tiny bit of strategy. Missions and cards added a bit of strategy to the game but it was at its core still all about chance. Warlight is available as a limited Flash based version of the game that you can play alone against the computer, and as a web service that offers multiplayer matches, as well as custom maps and rules. Interested users can play the Flash version of Warlight here to get a feel for the game, or visit the multiplayer start page to play against human opponents and / or computer players on custom maps. An account is required to play multiplayer, but the values that you enter are not verified by the service (including the email address). The free account lets you play with up to six players (including you) on games that you create. Members, those that pay $29.99 for a lifetime membership, can create maps with up to 24 players and have additional options that free players do not have. This includes the ability to create tournaments, play in ladders, use the statistics window or use custom scenarios in games. For most, the free membership option should be more than sufficient. First thing that you want to do after signing up is to click on Multi Player and then on Create Game. You have the option to play a template based game (with options to change the configuration), or create a custom game which basically creates a new template that you can save. Custom game allows you to pick the map that you want to play on against the AI or friends. 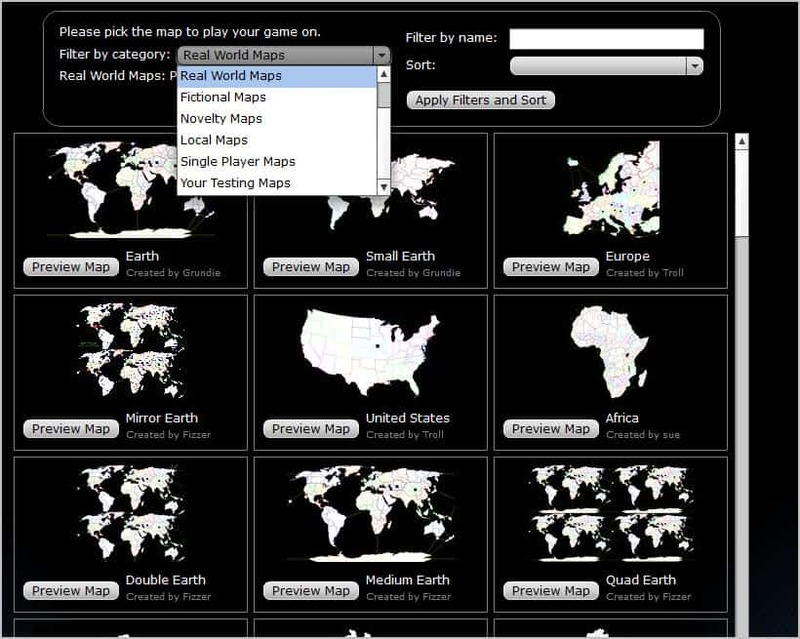 The game offers hundreds of maps divided into groups such as real world maps, fictional maps or local maps. This ranges from the standard earth setting in various sizes to fantasy worlds such as Warhammer, Middle Earth or Skyrim to plain out crazy novelty maps that come in all shapes and sizes. You can preview maps which is helpful as it displays the number of different regions of that map. The more regions the longer the game, basically. The settings options allow you to customize the game. 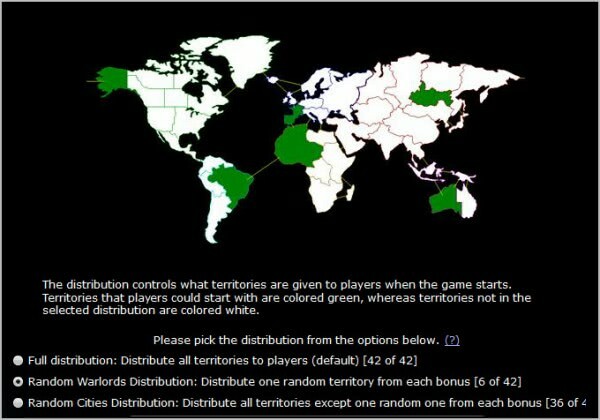 Here you can select if you want to play a team game or free-for-all game, the level of fog of war, how the initial distribution of regions takes place, how many bonus points players get for occupying a set of region and the game's bonus card system. All regions of the world, or only select regions can be made available to players during start. Some game modes allow players to pick preferred starting locations. It is then still a game of chance if they get that location, considering that other players may also want to start in the selected region. Many different bonus cards are available. From the common reinforcement card to spy cards (which only make sense if fog of war is active) and diplomacy cards that enforce peace for a specific amount of turns. Players get card fragments when they conquer countries. Friends, AI or open seats can be added to the game in the final step. You can invite friends to make sure that they can play the game with you. If you would add open seats instead, chance is that a stranger could join the game instead of your friend. On the multi-player tab, you need to invite at least one human opponent. The game itself can be played as a realtime game or multi-day game. Realtime games have a time limit of 5 minutes per turn with all players taking turns at the same time to reduce the waiting period. In each turn, players begin by adding new troops to the regions they control. Each player receives a set amount of troops that does not change, plus bonus troops based on the regions occupied and cards that have been played. they can order their armies to attack regions or to move into adjacent territories. The results are calculated once every player has ended their turn or the time has run out. It is then possible to watch the events unfold or skip to the end to see the end results. Warlight is a great Risk-like game that offers a lot of variety thanks to hundreds of maps and customizations. If you like Risk, you will love this game. Tiny Iceland is in the map, but not New Zealand, Sri Lanka, or the Philippines? Talk about geographic myopia.